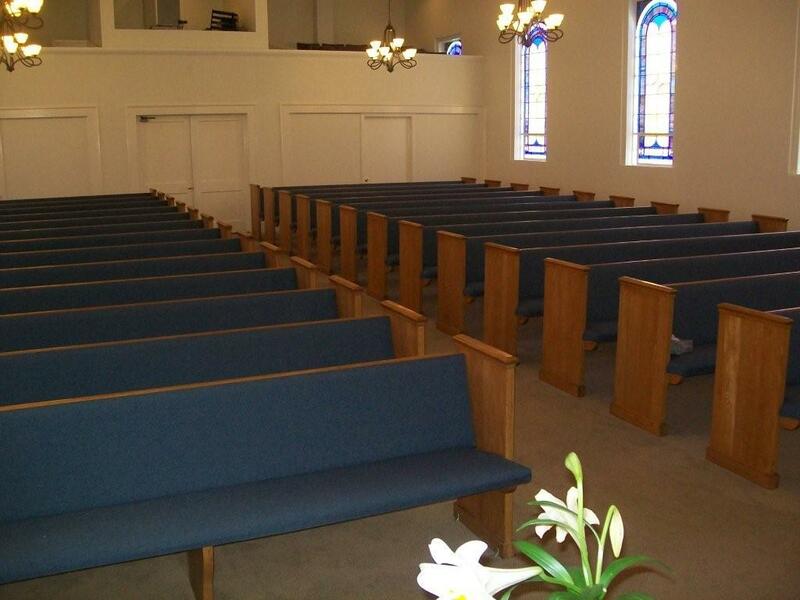 We really enjoyed working with Pastor Edward on the their new pews and chairs. 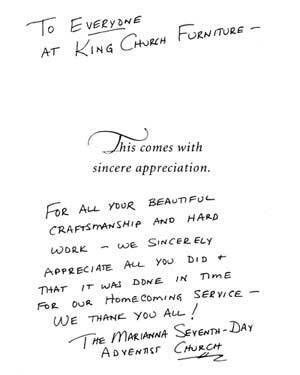 We love when we get a “Thank You” letter, on behalf of the church congregation, especially one like this! With much appreciation this letter is being written. 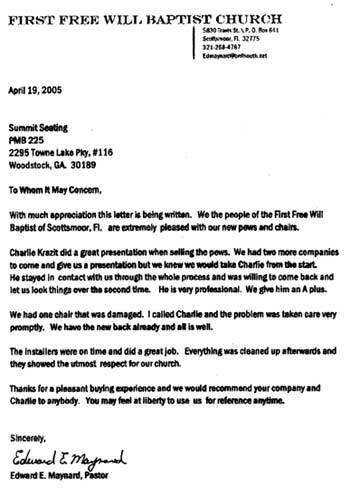 We the people of the First Free Will Baptist of Scottsmoor, FL. 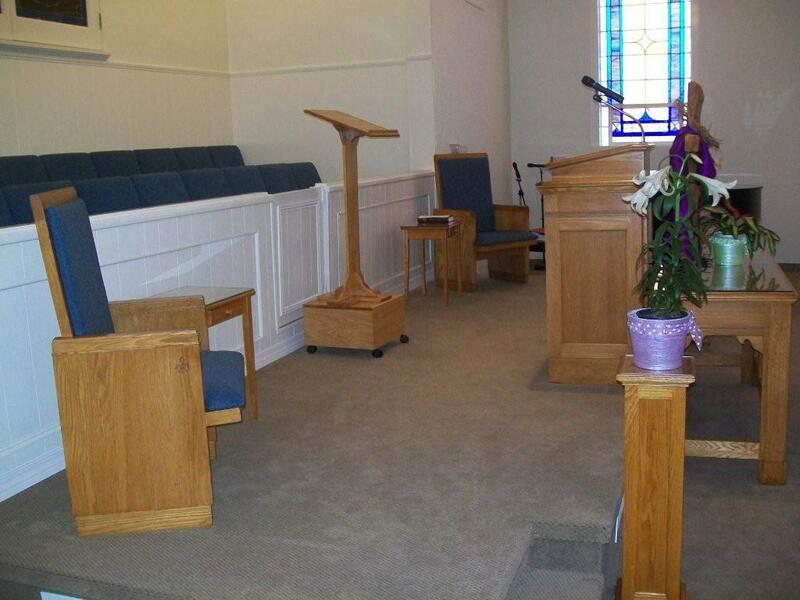 are extremely pleased with our new pews and chairs. Charlie Krazit did a great presentation with selling the pews. We had two more companies to come to give us presentations but we knew we would take Charlie from the start. He stayed in contact with us through the whole process and was willing to come back and let us look things over the second time. He is very professional. We give an A plus. We had one chair that was damaged. I called Charlie and the problem was taken care of very promptly. We have the new back already and all is well. The installers were on time and did a great job. Everything was cleaned up afterwards and they showed the utmost respect for our church. Thanks for a pleasant buying experience and we would recommend your company and Charlie to anybody. You may feel at liberty to use us for reference anytime. 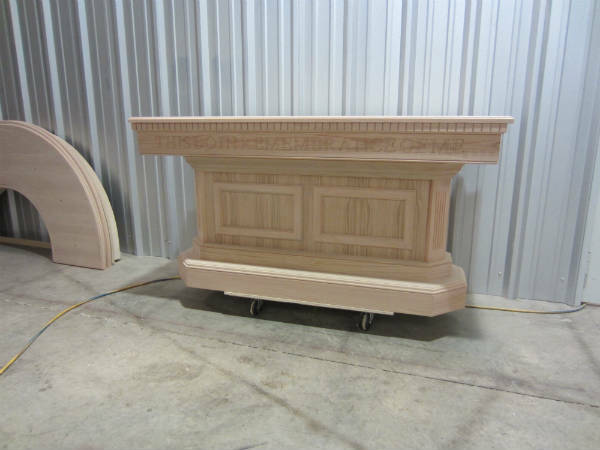 Bethel Baptist Church, a local church, contacted us about pews for their recent Judgement House presentation. 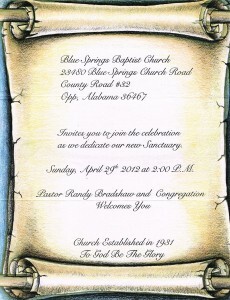 We gladly donated the pews for the great work their doing in our community! 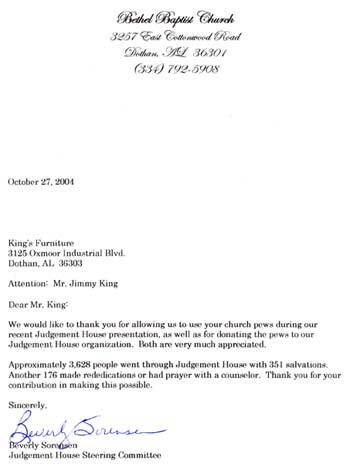 We would like to thank you for allowing us to use your church pews during our recent Judgement House presentation, as well for donating the pews to our Judgement House organization. Both are very much appreciated. Approximately 3,628 people went through Judgement House with 351 salvations. Another 176 made rededications or had prayer with a counselor. Thank you for your contribution in making this possible. 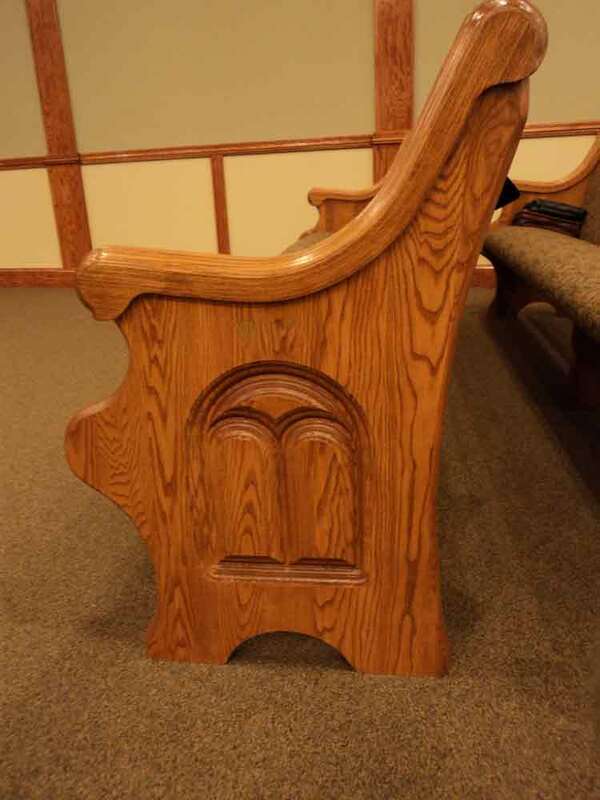 We pride ourselves on the craftsmanship that we put into every church pew or piece of church furniture we build or install. The Marianna Seventh-Day Adventist Church, in Marianna, Florida, is no exception. We were pleased that the congregation was greeted with that craftsmanship, for the first time, at their Homecoming Service. This custom speaker stand turned out AWESOME! I am glad that NewJerusalem thinks the same, and we have helped another happy customer. All I can say right now is, “wow, wow, wow!! !” The pieces just take your breath away. The pastor and the whole congregation are just in awe of the finished product! We are using a small portion of our new building and the pulpit itself is just massive and only a reflection when it is finally put in the finished santuary. It is no doubt in the future if there is anything else we need we will contact you. Your product speaks for itself. God Bless and again thanks for getting it to us in time. 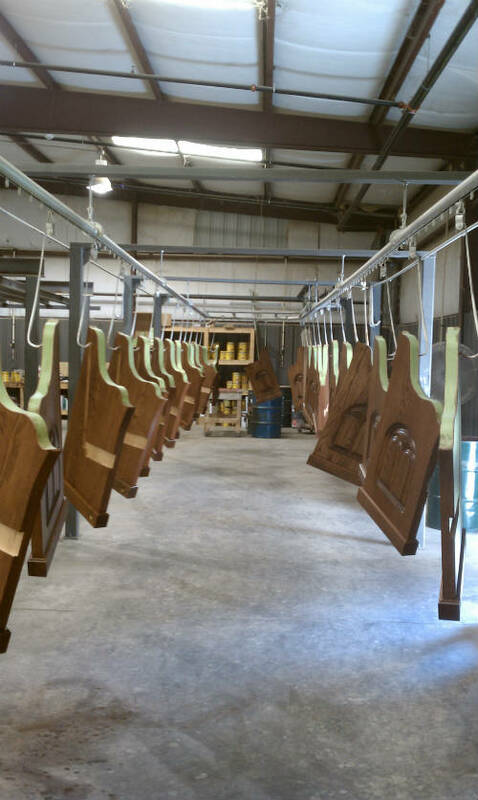 We thought we’d show everyone around our church furniture shop in Dothan, Alabama. Below are some photos of the things we are working on at the moment. 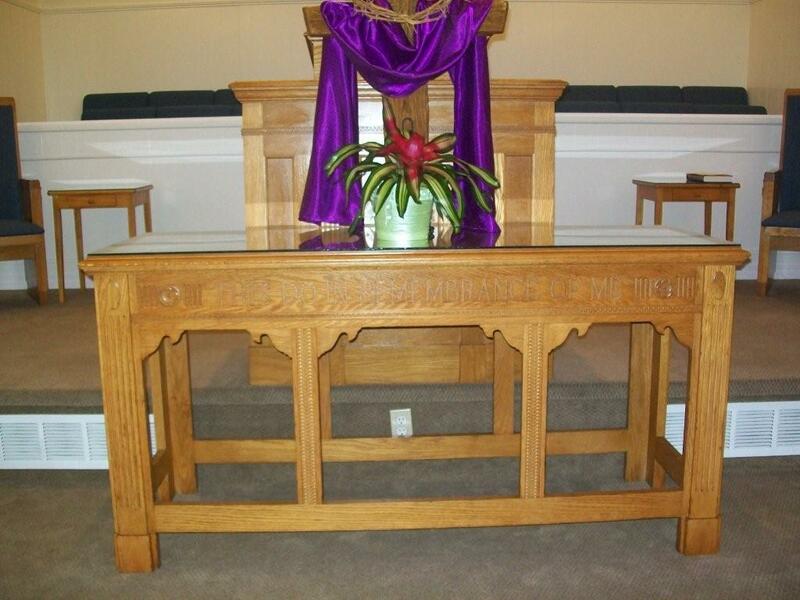 A communion table. Still unfinished, all it requires is a good coat of varnish. A communion rail in the final stages of work. 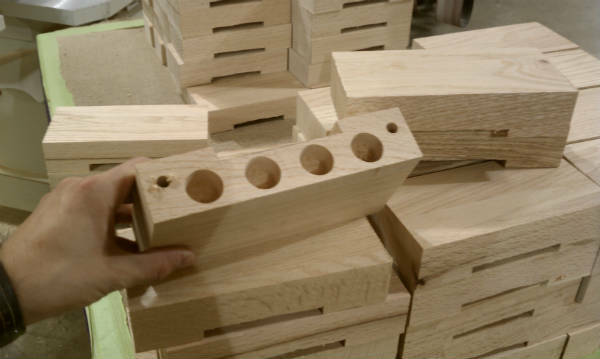 Cup blocks, which will be placed in the middle of songbook racks on the backs of some new church pews we are building. 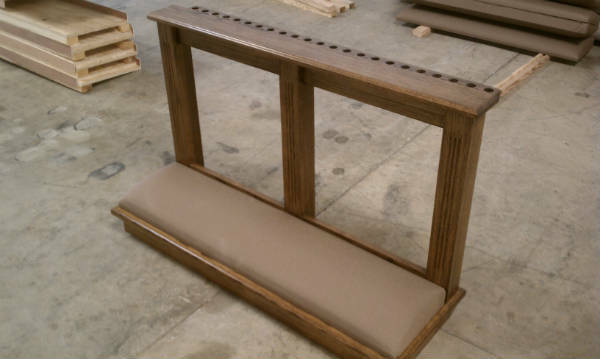 Church pew ends, on the spray rack. 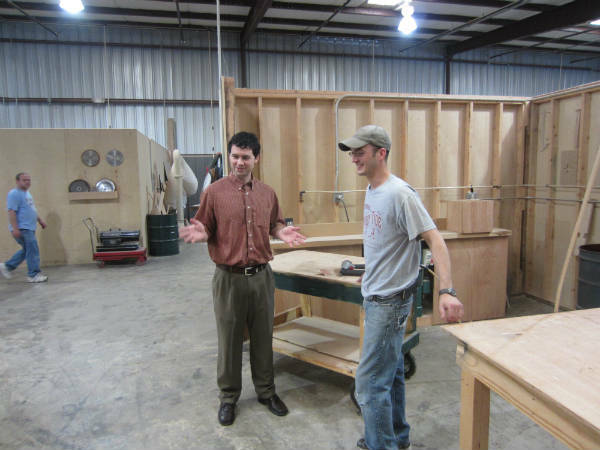 Besides building church furniture, Aaron and Brandon are also quite adept at solving society's problems. 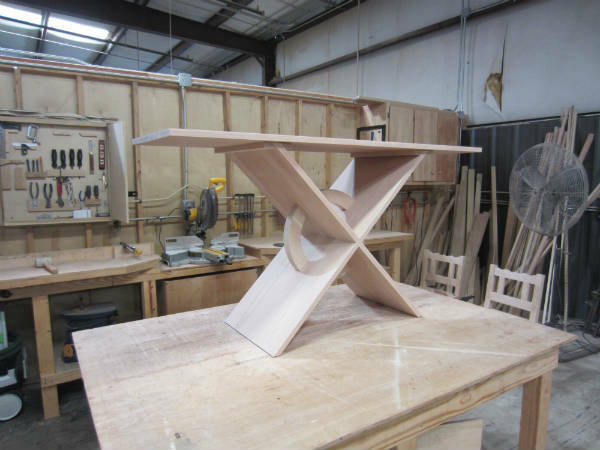 A custom alter table, still being sanded and smoothed. 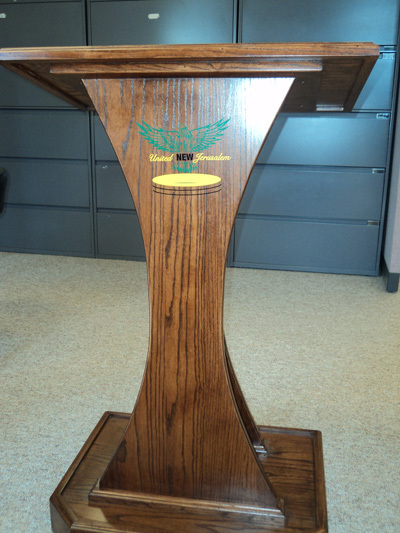 A reading stand in the foreground, with other items behind it. All are awaiting a coat of varnish. 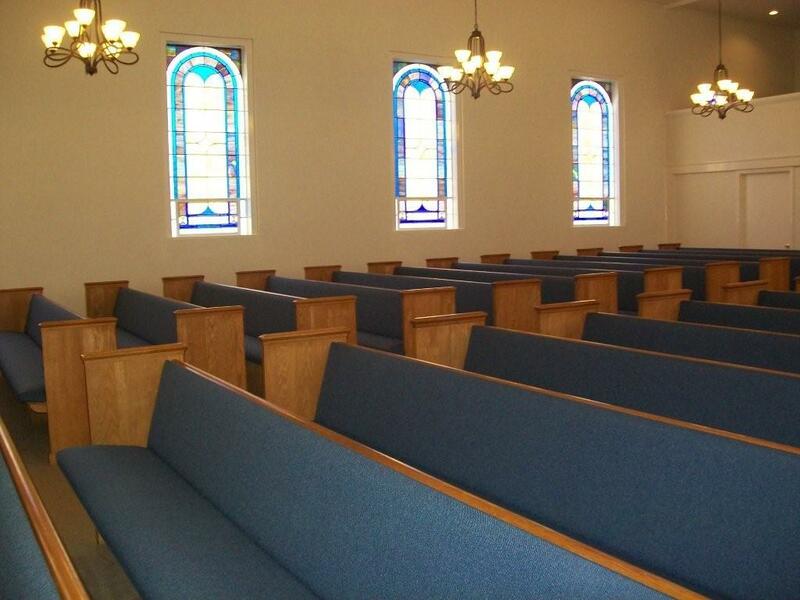 King Church Furniture enjoyed installing new pews, pulpit and choir chairs this month for Blue Springs Baptist in Opp. 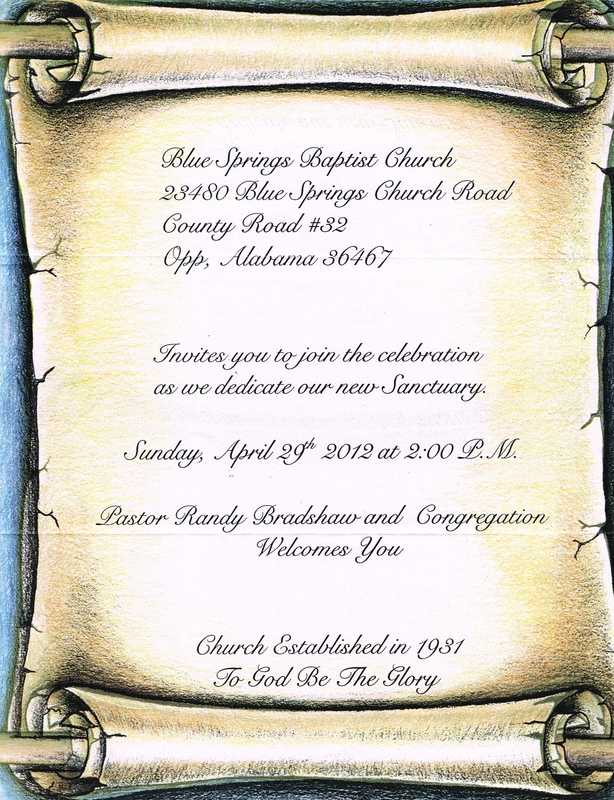 We received a dedication inviation for the new sanctuary at Blue Springs and are excited that we we’re able to be a play a role in opening their new sanctuary. 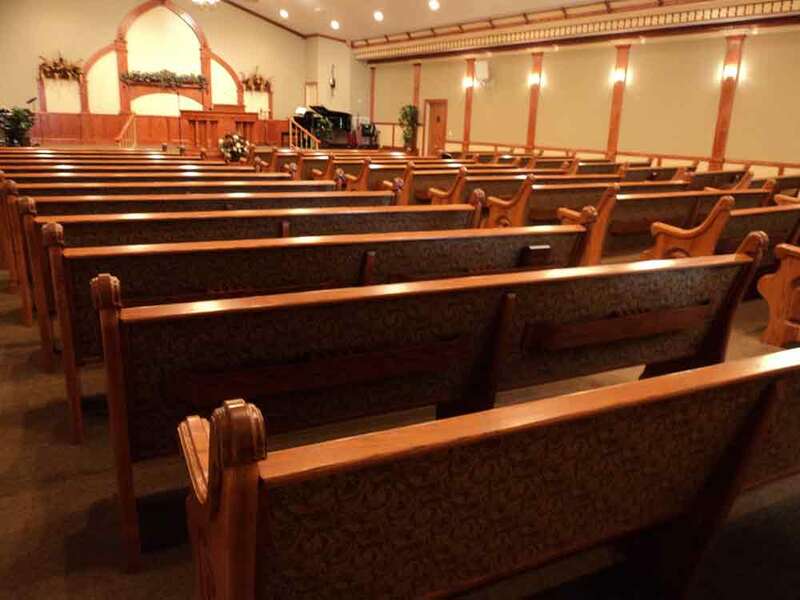 Creating and installing church pews and other furniture is a integral part of worship for church buildings is just one of our specialities. 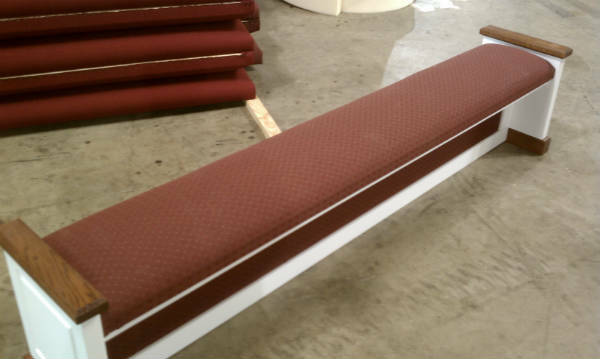 We strive to pay close attention to each customized detail for quality assurance, so we can rest assured knowing Blue Springs and every church will enjoy their new church furniture for many years to come. Few things are more satisfying than getting a “thank you” letter in the mail from a church we’ve recently performed work for. We recently received one of those letters from Pastor Hodges for the work we performed for his church in Frisco City, Alabama. We greatly enjoyed bringing new life to Oak Grove’s pews and sanctuary furniture and we can’t wait to help them again in the future. You can read the letter by clicking on the image to the left. 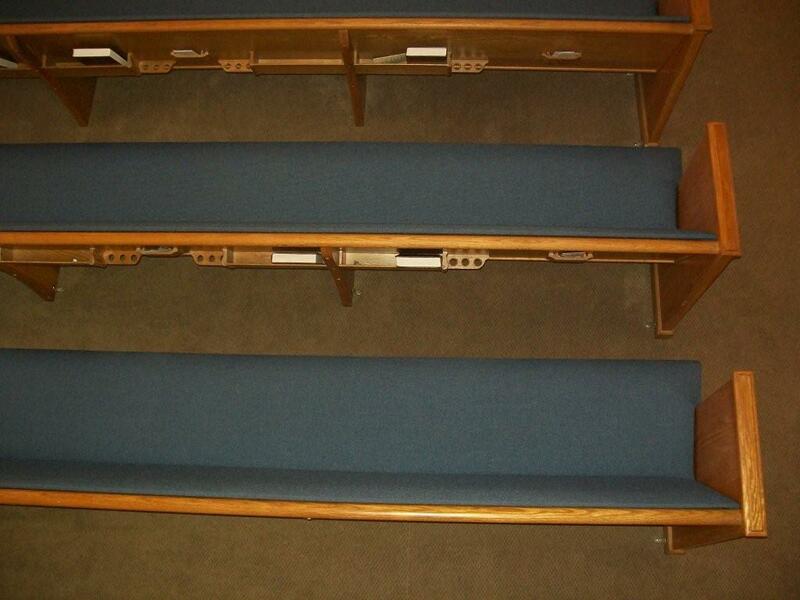 Church pews come in two main varieties, Upholstered and Finished. These two varieties are further defined into 4 different styles. Below is a list of those styles starting from the most economical to the most expensive. Mt. Sinai Holiness Church was built by the church members, with their Pastor doing a most of the custom woodwork and carpentry. 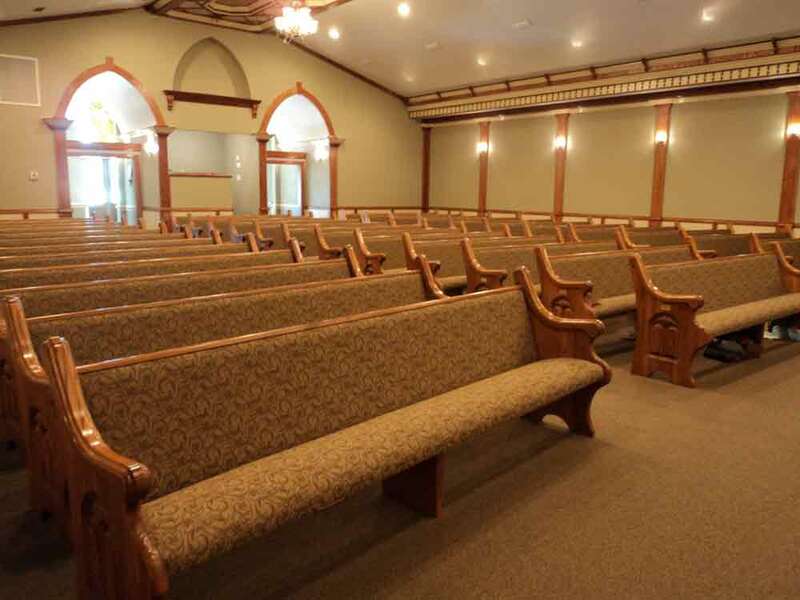 In September, 2010, the building was complete and King Church Furniture had the pleasure of installing the church pews. The customized woodwork and paint scheme, custom front door, stained glass transoms and pews of course, make this one of the most beautiful churches I have ever seen. 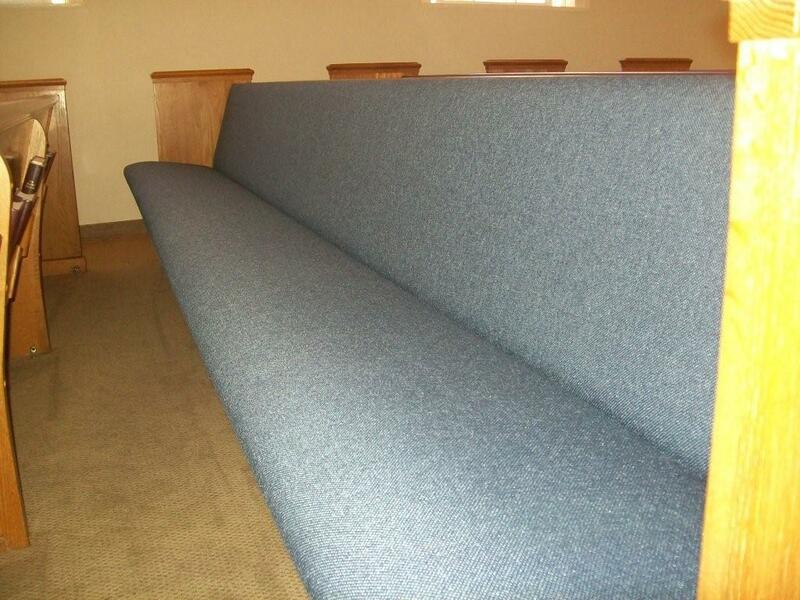 We love creating, customizing and installing church pews, especially in a new church building. 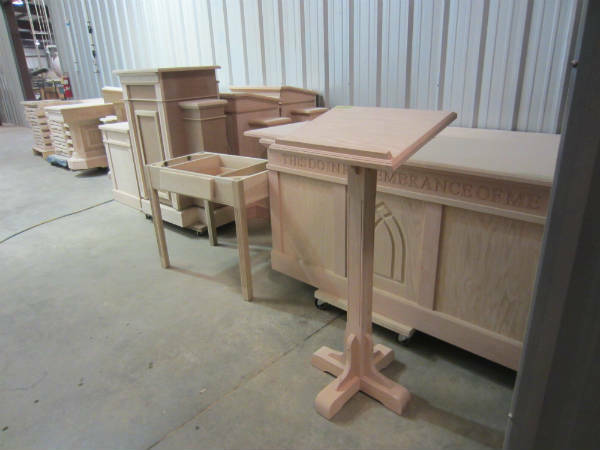 We strive to pay close attention to each customized detail for quality assurance, so we can rest assured knowing that the every church will enjoy their new pews for many years to come.